Both were unanimously voted into office and gave their thanks to councillors for the opportunity to represent the Town Council in the coming year. 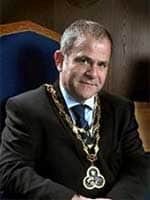 Following the resignation of Cllr Shanker Gaire as Mayor and Cllr Tony Searles as Deputy Mayor the Council would like to report the election of the new Mayor of Swanley. On Wednesday 9th November the Full Council elected Cllr Laurence Ball as Mayor of Swanley for the remainder of 2016/17 and Cllr Lesley Dyball as deputy mayor. 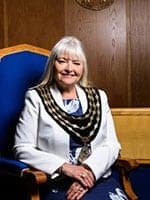 Cllr Ball said ‘it is a privilege to be Elected Mayor of Swanley by your peers on the Council and I thank them for this opportunity. Whilst the circumstances of this mid-term appointment are unfortunate the Deputy Mayor, Lesley Dyball, and I will do our best for the people of Swanley.